Achyutananda Das (Achutānanda) or Acyutananda was a 16th-century poet seer and Vaishnava saint from Odisha, India. He was considered to have the power to see the past, present and future. He was a prolific author, and one of the group of five, that led a revolution in spirituality in Odisha by translating Sanskrit texts into the Odia language for common people. He was one of the famous five friends of spirituality and literature Panchasakhā, who transcribed ancient Hindu Sanskrit texts into Odia, for the people of Udra Desha (Odisha). Shri Achyutananda Das was the most prolific writer of the Panchasakhas and wrote numerous books, many of which could be loosely translated as the Book of Prophecies. He is known as the Mahapurusha (a Great Person) for his vast knowledge on many subjects such as spirituality, Yoga, rituals, Buddhist Tantra, Ayurveda (science of life, longevity and medicine), and other various science and social regulations. As Acyutānanda became a popular figure, much of his life began to become legend. He is famous for being one of the few who wrote about the social situation of his time and this is a scholarly reason many study his writings. His poetry was often cryptic about himself, and written in code or analogies. Achyutananda belonged to Karana caste by birth, but some claim he was yadava. His surname Das means servant of God. Acyutānanda was born in a village by the name "tilakana" ', where two distributaries of the Mahanadi, Luna(Labana Dhara) and Chitrotpala bifurcated, of Cuttack district of Odisha, during the twenty first anka (year of region) of the Gajapati (king) Purushottam Deva. This is thought to be somewhere between 1480 and 1505 by different scholars. His mother was Padmavati, and his father was Dinabandhu Khuntia, and his grandfather was Gopinath Mohanty, a scribe in the Jagannath Temple, Puri. He was born after his mother prayed at the pillar in front of the Jagannath Temple, and his father had a dream that the divine bird Garuda brought him a child. In legend he is believed to be an incarnation of Garuda. Acyutānanda had a formal education in Puri. It is agreed by most texts that, like many contemporaries, he met Shri Chaitanya Mahaprabhu in his youth, but did not become a follower of Chaitanya Mahapabhu's Gaudiya Vaishnavism. He became the youngest of the Panchasakhā. Acyutānanda was part of the famous Panchasakhā ('five friends'), who lived between 1450 and 1550 CE. The contemporaneous five saints – Acyutānanda Das, Ananta Das, Jasovanta Das, Jagannātha Das, and Balarāma Das, shaped Vaiṣṇava philosophy, spiritualism and literature of Odisha. Two important factors set the Panchasakhas apart from other Indian Hindu Saints. They were the first to take the Hindu Sanskrit texts into the reach of the common people, by translating them into the local language (Odia). This was first done by Sāralā Dasa's translation of the Mahābhārata in the mid-fifteenth century, followed by Balarama Dasa's Jagamohana Ramayana, Jaganath Dasa's Bhagavata Purana, and Acyutananda Dasa's Harivamsa. The second aspect is their form of Odia Vaiṣṇavism, which sees God as the "Shunya Purusha" and the nature of the soul as being able to merge into the Absolute. Some authors, such as N.N Vasu, have depicted Odia Vaishnavism as 'Buddhist-Vaishnavism', since it does not accept Ramanuja's Viśiṣṭādvaita philosophy (11th century), nor does it adhere to orthodox Gaudiya Vaishnavism created in the 16th century. Other scholars, such as Prabhat Mukerjee, have denied these claims supporting the different varieties of Vaishnava philosophy. Scholars debate the influence of the Panchasakha from the original Vaishnava Agama (Pancharatras) while others source their ideas in Sahajayana Buddhism, and the Natha sampradaya. Both the Sahajayana Buddhists and the Panchasakha worshipped the image of Jagannatha as the Buddha, though the Panchasakhas saw Jagannatha as an incarnation of Vishnu as seen in the Dasāvatara image on the main mantel of the Jagannatha Temple. Achyutananda had predicted the birth of many saints of Bengal, viz. Aurobindo Ghosh, Ramakrishna, Sitaramdas Omkarnath [earlier name Probodh Chandra] etc. In Raj Samhita and Shunya Samhita, Achyutananada foretold even a brief biography of Sitaramdas Omkarnath. Utkaliya Vaishnavism (sometimes called Odia Vaishnavism) developed into its present state, in the 15th century. According to the Panchasakhas, Lord Jagannath is the 'Purna-Brahma', and all the avatars of Vishnu emanate from Him, and also enter into Him at the end. Jagannatha was the chief god of the devotional sect. The chief ideal of the Panchasakhas was that, as a bhakta they would be faithful, humble, learned, selfless, active, benevolent and affectionate. The Panchasakhas were against the caste system, they considered all beings as one. They translated the Sanskrit Classics into local language, Odia. Anyone could become a Vaishnava, even Muslims. At the time of Shri Chaitanya, his followers who came from Nadia, called later as Gaudiya, were considering themselves greater or superior to the Utkaliya Vaishnavas and were disregarding them. So there was a cold war between them. Knowing this, Shri Chaitanya conferred the title of 'Atibadi' (the great) on Jagannatha Das to keep up the dignity of the Utkaliya Vaishnavas. But it brought no solution, and on the other had created conflict among them. The conflict of these two groups are evident in the Basana Charita Gita of Acyutananda, and even in modern-day derogatory language of the Gaudiya towards the Utkaliya Vaishnavas. This Brahman is called Shunya Brahman. Achyutananda (and the other four saints) believed in a concept of God (Vishnu) as Shunya (emptiness, void, zero) called Shunya Purusha and/or Shunya Brahman. This shunya signifies a transcendental principle that eludes the conceptual nexus applied to human thinking as described in the Upanishads. Achyutanada's culminating work is called the Shunya Samhita where he discusses this philosophy in depth. śūnyara ākāra viira śūnyara vicāra, śūnye thāi dekha vīra e sacarācara. dekha e sacarācara śūnyare prakāsha, śūnyu ude hoicanti śūnyare vilāse. Ground of all discriminating knowledge. Everything flourishes in the Shunya Brahman. dui je deṇāre pakṣī uḍikari jāi, dui je cakṣure sehi saṃsāre khelai. 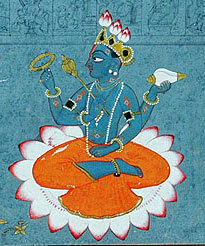 eka je na thile kaṇā dui gale anḍha, eṇukari nirguṇa saguṇa sehi bheda. A bird can only fly with both wings. It can have a perfect vision with both the eyes. In the absence of one, it becomes one-eyed, and in the absence of both, it is totally blind. Thus like two eyes Nirguna [god perceived as formless]and Saguna [god perceived with form] are chained together. The Panchasakhas were Vaishnavas by thought. But they differed from Chaitanya's path of devotion and preached Jnana-mishra bhakti or Devotion with mix of Wisdom. Chaitanya's path of devotion was known as Raganuga Bhakti Marga (brought to Odisha in 1509), which says all you need is love (devotion) to reach God. The Panchasakhas believed that one needs a combination of love (bhakti) and wisdom (Jnana) to reach God. With our knowledge if we show our pure love (bhakti), we can definitely get the sunyatma (GOD). The Panchasakhas therefore promoted a Vaishnavism that involved study of scriptures, yoga, rituals, and devotion. The concept of the Piṇḍa-Brahmāṇḍa is that the body (piṇḍa) is a replica of the Universe (Brahmāṇḍa), or microcosm is a reflection of the macrocosm. Much of the yogic teachings of Acyutānanda are based on this core concept. His teachings are filled with references to outer locations existing as energies in the body. May be you are the eldest or the youngest. This knowledge is memorised by every soul. ^ Due to lPANDIT LATE KURAMANI PATHI SAHRAMA THE EXACT LOCATION OF BIRTH PLACE OF SRI ACHYUTANDA HAS BEEN IDENTIFIED. ^ Chattopadhyay, Sanjib (19 February 2011). "'Sri Sri Sitaramdas Omkarnath Shivthakurer kache ki Mantra peyechilen'". Bartaman Patrika (Bengali: বর্তমান). p. 12. ^ "Chaitanya's Panchasakha and Lord Jagannath" (PDF). Retrieved 5 May 2017. Chaini, Ratnakar. Achyutananda Das. Sahitya Akademi, Calcutta, 1998. Mansingha, Mayadhar. History of Oriya literature. Sahitya Akademi, New Delhi,1962. Patnaik, Tandra. Sunya Purusa. Utkal Studies in Philosophy XII. Utkal University, Bubhaneswar in association with D.K. Printworld (P) Ltd., New Delhi, 2005. Mishra, Ramprasad. Sahajayana: A Study of Tantric Buddhism. Punthi Pustak, Calcutta, 1991. Mukherjee, Prabhat. History of Medieval Vaishnavism in Orissa. Asian Educational Services, New Delhi, 1981. Sri Sri Mahapurusa Siddha Ashram. Glimpse of a Yogi; Sri Sri Mahapurusa Achyutananda Das. Sri Sri Mahapurusa Achyutananda Trust, Sri Ram Nagar, Puri, Odisha, India, 1998. Das, Alekh Prasad. Jibanara Daka; an autobiography, 1994; published by Sri Lalita Prakasani, Bhubaneswar. Won Odisha Sahitya Academy Award for autobiography in 2000.
http://www.sai.uni-heidelberg.de/abt/IND/publikation/biborissa/biborissa.htm :The library of the South Asian Institute (SAI), University of Heidelberg, has some references and recollections of the original works of Sri Achyutananda Das. An "Orissan Project" was undertaken some decades ago, funded by the German Research Council, as a part of the studies of the South Asian cultures. A number of references can be found in this library.